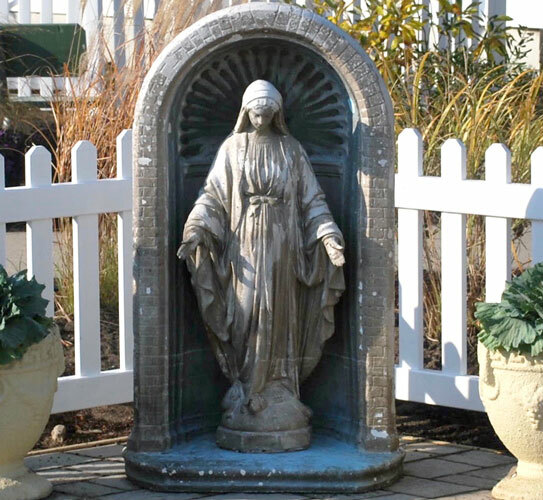 This statue that survived Sandy has become a symbol of recovery at Blessed Trinity parish. With the four-year anniversary of Superstorm Sandy approaching, Father Peter Rayder and Blessed Trinity parish, Breezy Point, are grateful for the community spirit in their churches. “They are faithful people; they live their faith. They support each other and possess a general feeling of community. When one hurts, they all hurt,” said Father Rayder, pastor since July 1, 2012, just months before the devastation of Sandy severely impacted the lives of thousands of New Yorkers. “Of course Sandy affected the community and it is still affecting the community. If you were to walk around the neighborhood, there is so much construction going on. There are numerous houses that are still in the process of being raised, so many people who are still not in their homes. While people outside of this area have moved on, these people are still trying to rebuild. Almost four years later and there are people still not living in their homes,” Father Rayder explained. Amazingly enough, despite the on-going impacts of the storm, Blessed Trinity has already reached 85 percent of it total goal of $645,000 in the Generations of Faith drive, with just about 70 pledges. Blessed Trinity parish consists of three different churches: St. Thomas More and St. Edmund in Breezy Point, and St. Genevieve in Roxbury. “Between the three churches, there are nine buildings, so we are in a unique situation with our case,” Father Rayder explained. St. Edmund hopes to continue the renovation of its Catechetical Center. St. Genevieve plans to replace the doorways and doors in Father Hession Hall, paint the church interior and update the sound system. St. Thomas More wants to complete the entrance renovation project by installing new windows and renovate the interior sanctuary. “We have 18 chaperones and teenagers going to World Youth Day this year, so our parish really needs to be prepared with an enhanced youth program when they return home rejuvenated in their faith,” explained Father Rayder. “We are looking at a bright future and we are preparing ourselves now. We’ll have a youth minister in our parish, so we’ll serve the needs of our teens. “We will implement the foundation for the retired priests and locally, we will strengthen our parish in small but positive ways,” Father Rayder said.